2. Login using your Cadimage credentials. 5. This will begin downloading the Cadimage Installer, which you will then use to install all of your Tools. c) Click through Next through the install wizard, and then Finish. 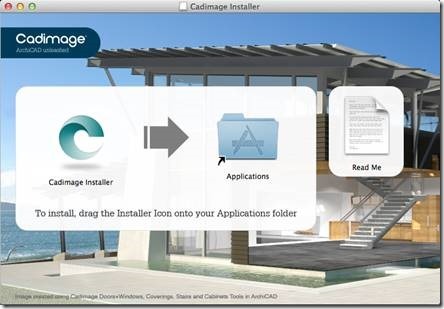 b) Drag the Cadimage Installer into the Applications folder. c) Double click the Applications folder. d) Double click the Cadimage Installer to launch the Tools Installer. 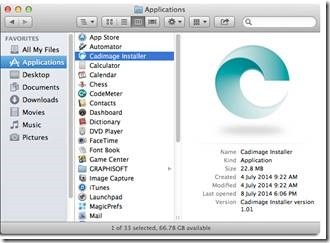 The Cadimage Installer manages the installation of the Cadimage Tools. There are 3 options in the installer: Install Cadimage Tools, Create and Offline Install File, and Reset Installation Settings. For now, we will be using the first option, but details on how the others work can be found at the end of this article. There are also 2 options for the installation type - Commercial/Trial, or Educational. The actual use of the installer once you've chosen one of these is the same, so just make sure you choose the option you require here before proceeding. 1. First, with Install Cadimage Tools selected, enter your MyCadimage credentials, and then press the Login button. 2. You will then see a list of the Tools that you can install. Along the top of the window are options to view the tools that you own (My Tools), updates for tools you have installed already (Updates), and tools that you can install 30-day trial versions of (Trial). To the right of those buttons, you will see an option to choose which version of ARCHICAD to install to - ARCHICAD 18, 19, 20, and Start 2015 and 2016 are supported. To start installing tools, simply click the Install button to the right of the tool you want in the list, or hit the Install All button at the top left corner of the list to install all the listed tools. 3. A small progress bar will appear next to the Install button to show the installation progress, and then once done, will change to an Uninstall button. 4. Once you've installed everything you need, Exit the installer by clicking the Close button. NOTE: The Cadimage Installer will check for Tool updates whenever you run it, and will also update itself if there is a new version available. If you already have the tools installed, you can update them by simply running the Cadimage Installer which you installed in Part 2 above. Login as detailed in Part 3 above, and then click on the Update button in the upper row of the interface. You will then see a list of updates that are available for you. Similarly to the steps in Part 3 above, you can then press the Update button to install any updates that you want, or hit the Update All button to install them all in one go. Once the process is complete, just exit the installer by clicking the Close button. In some cases, you may want to install a set of tools on a computer that has no internet connection, or you simply want to streamline the installation process to run on multiple computers. To do this, you can use an Offline Install File. You will see a list similar to what you get when Installing or Updating. Making sure to select the ArchiCAD Version you want first, go through the list and click Add next to each tool that you want to include in the package (or choose the Add All button). When you have added everything you want, hit the Save button on the top right corner of the installer. If they have asked you to, simply run the installer, choose the Reset Installation Settings option, hit the Reset Settings button, and then confirm your choice by hitting Reset.